President Trump is one step closer to getting a new trade deal with Canada and Mexico. But he has many, many more steps to go. Trump's trade team published a list of objectives Monday that outline the administration's goals for renegotiating NAFTA, the three-nation trade pact that went into effect in 1994. A new NAFTA will probably take more than a year to enact, and possibly longer, depending on negotiations and political forces in the three countries. 1. Official talks can begin 30 days after the list of objectives is published, which means bilateral negotiations will start August 16. They're expected to last until about January, but it could go longer. 2. The Trump administration must consult with the House Ways and Means Committee and Senate Finance Committee. 3. 180 days before signing the deal, Trump's team must submit a report to the congressional committees on the potential changes to U.S. trade law. 4. 90 days before inking it, Trump must notify all of Congress about his intent to sign the deal. On the same day he must give the details of the agreement to the U.S. International Trade Committee, an independent panel of judges. 5. 60 days before signing the deal, Trump's team must publish the text on the website of the U.S. Trade Representative. 6. President Trump can sign the deal. 7. 60 days after entering the agreement, the administration must provide a public description of the changes to U.S. laws in order to bring the U.S. into compliance with the deal. 8. 105 days after Trump signs it, the ITC publishes a report assessing the economic impacts of the revised deal. 9. 30 days before submitting the bill to Congress, Trump must send a statement which includes the final legal texts of the deal. 10. Before introducing the bill to Congress, the administration is required to submit a review of the deal's impact on employment and the environment, and a plan for implementing and enforcing the agreement. 11. 45 days after submission, the House Ways and Means Committee must report the bill, meaning it needs a majority vote in the committee to go to a full House vote. The committee could also suggest amendments or other tweaks to the trade deal. 12. 15 days after that, the full House of Representatives must vote on the bill. 13. 15 days after that, Senate Finance Committee must report the bill. 14. 15 days after that, the full Senate votes on the trade deal. 15. 30 days before officially entering into the agreement, Trump must send a letter to Congress saying he's determined that the United States has taken measures necessary to comply with the agreement. Take a breath, because even that timeline comes with caveats. All those days Congress has to consider the new NAFTA are legislative days -- not real, calendar days. In total, Congress gets 90 legislative days, which could in reality stretch over several months. There's more. The governments of Mexico and Canada must also ratify the agreement while this is going on. If they don't ratify it, there's no new deal. 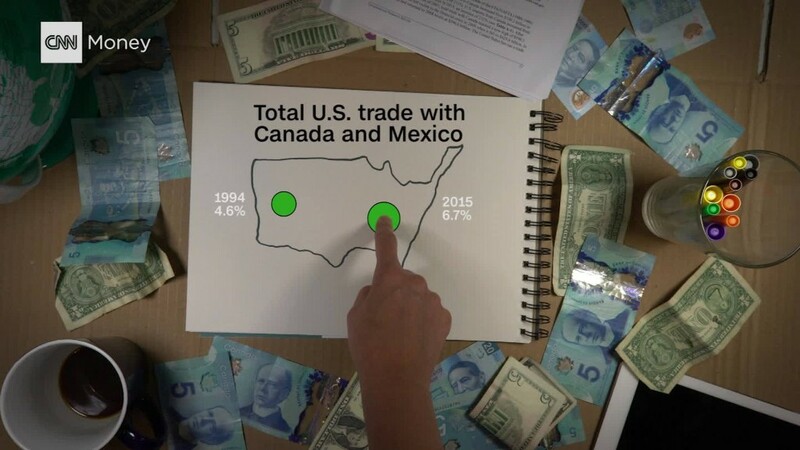 That's important to remember because Mexico holds presidential elections in 12 months, and the leading candidate, Andres Manuel Lopez Obrador, a Trump critic, has threatened to get tough on U.S. trade. It's unclear what he plans to do, but if he gets elected, the official U.S. timeline for renegotiating NAFTA would likely get wrapped up in Lopez Obrador's presidency.